An entrepreneur from the University of Bristol has been named on an exclusive list of top business people under the age of 30. Sam Harris, who is in his final year studying Biological Sciences, has made Shell LiveWIRE’s annual ‘Hot 40’ entrepreneur list – a shortlist of the best and most innovative young business people in the UK. 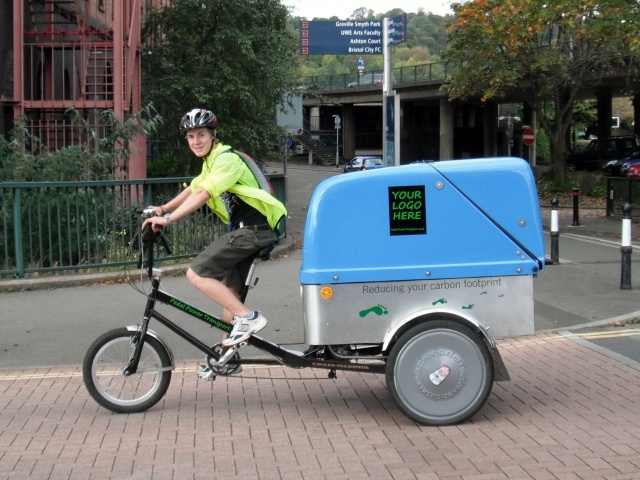 The ambitious 22-year-old fought off competition from hundreds of young entrepreneurs to gain a coveted place on the list for his business Pedal Power Transport, which uses specially-adapted tricycles to deliver people, parcels and recycling around Bristol. He made it through to the ‘Hot 40’ after winning a £1,000 Shell LiveWIRE Grand Ideas Award prize, designed to help aspiring entrepreneurs to get their business ideas off the ground. Sam, from High Kingsdown, said: “It’s a great feeling to be in the list. It was a complete surprise and it feels thoroughly undeserved. Obviously my mother can’t stop talking about it. Pedal Power Transport is a local delivery service, catering for all manner of deliveries, mainly working for butchers, bakers, florists, printers and restaurants. Its eye-catching rickshaws have even been hired as wedding transport and for tours of the local area. The company was started in the summer of 2011 and still runs out of its offices at Basecamp, the University of Bristol’s dedicated student start-up space. Sam has participated in a number of the SETsquared Student Enterprise events over the last year including the Deloitte pitching day. Sam’s not the only University of Bristol entrepreneur to receive a top accolade – a former student has been named on the shortlist for the Young Entrepreneur of the Year Award 2012, also organised by Shell LiveWIRE. Nithin Thomas (MEng 2005, PhD 2010) founded SQR Systems with follow engineering student Rockman Law in 2010 to develop secure data distribution solutions for various technologies used in the security industry. It develops technology to securely distribute video across networks with limited bandwidth. The software enables users to reduce their bandwidth requirements while protecting sensitive data from illicit access. Jonathan May from Sponsorcraft – a crowdfunding website for students to showcase exciting projects to friends, family, and alumni and tap into these networks to achieve their funding target. Sponsorcraft brings alumni sponsorship into the 21st century by utilising the power and increased connectivity of social networking. Charlie Francis from Lick Me I’m Delicious – a company which sells liquid nitrogen ice cream creations at corporate events, weddings and parties. The business has created the UK’s first portable nitro ice cream parlour which uses a unique liquid nitrogen injection system to make two custom ice cream flavours for up to 500 people. Basecamp is the University of Bristol’s student start-up support service. Providing peer-support, desk-space, access to a student-run £30,000 seed fund, business advice surgeries provided by Veale Wasbrough Vizards, SWAIN, and Ernst & Young, master-class events, and opportunities to get advice and mentoring through a pioneering LinkedIn group of local and alumni entrepreneurs.